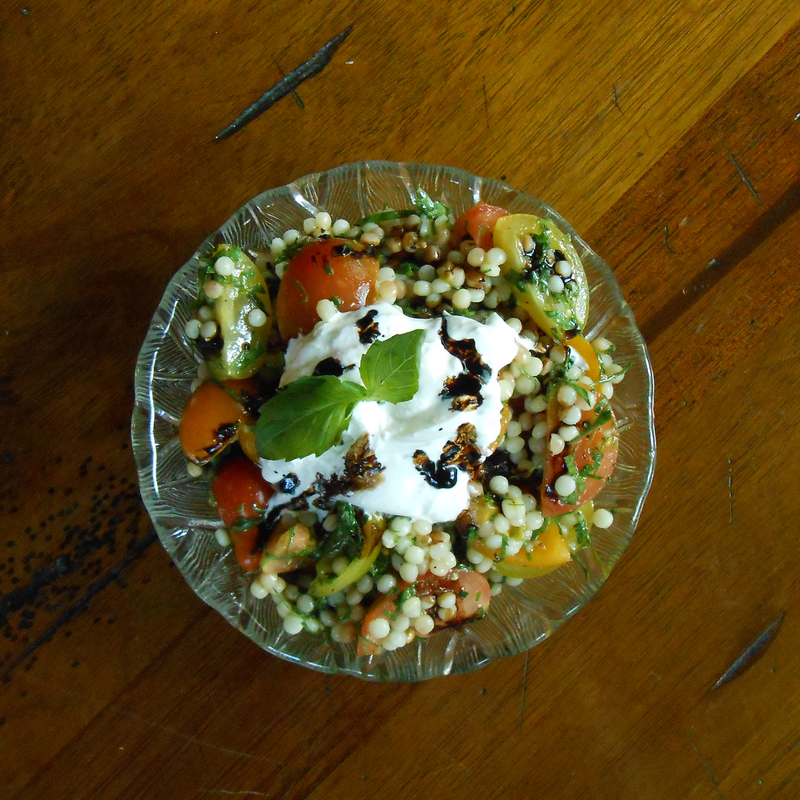 This recipe came out of an idea to combine Caprese salad and tabbouleh, omitting regular couscous and substituting the far superior Israeli version. Regular couscous is high maintenance: it needs fluffing since it has the texture of chewy sand, and it gets stuck in your strainer, or worse, falls through it. Burrata is the richest, pillowiest fresh mozzarella you've ever had—it's literally stuffed with cream. Trader Joe's sells it now, so we're pretty sure it's gone mainstream. Sometimes it's nice to use artisanal mozzarella, decade-old balsamic vinegar, floral Thai basil, and heirloom cherry tomatoes, but if you get the normal versions of these ingredients, the recipe will still work. Cooking is about using what you have, not what you think you need. Just make sure you get the right couscous. 1. Cook Israeli couscous according to package instructions. Strain and rinse with cold water until couscous is cold to the touch. Allow couscous to sit in strainer for a few minutes so excess water can drain off. 2. Toss together couscous, tomatoes, chives, parsley, basil, lemon juice, pepper, kosher salt, and olive oil in a mixing bowl. Taste and adjust seasoning as necessary. 3. Divide among four bowls. Top each portion with one quarter of the burrata. Sprinkle with Maldon salt and drizzle with balsamic vinegar.